Recent construction of 60 m² with heated pool and secure, south facing, facing the sea. Rental from SATURDAY to SATURDAY. Rates are quoted up to 4 people. You will be asked 150 € / week for any additional person. 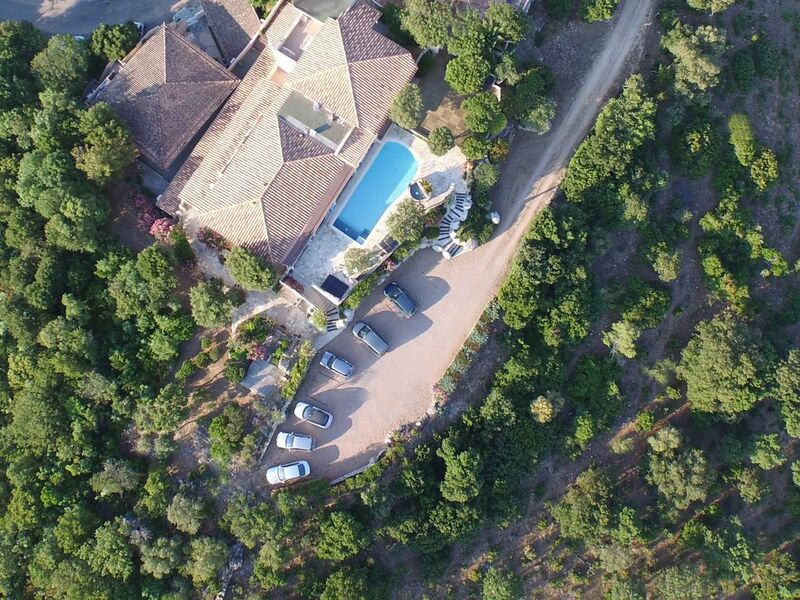 We offer a unique location above the Gulf of Porto-Vecchio, facing the sea. The through housing and air conditioned in ground pool is facing south and is surrounded by unspoilt nature, in a family residence with 4 apartments with heated swimming pool. In a very quiet and well maintained property, the apartments are beautiful, in excellent condition, well equipped and tastefully decorated. Very bright, benefiting more importantly a wonderful view of the sea. This means if the meals on the terrace are nice ..! There are less than 500 m Porto-Vecchio with its shopping centers, port and old town, shops, restaurants, cafes open late into the night ... You can enjoy the beautiful prestigious white sand beaches with turquoise waters, as the Bay of Saint Cyprien 9 kms, Cala Rossa Palombaggia 8 kms or 10 kms and 12 kms Santa Giulia. Furthermore, we are equidistant from the most beautiful beaches in the far south of Corsica, 15 kms from the Ospedale forest. Do not miss the visit of the Bavella needles and a hot river ... Plan a getaway to Bonifacio and Lavezzi Islands cruise. Well located on the heights of Porto-Vecchio, the area is ideally placed for touring the area. If we add the proximity 150 meters from a bakery, a self-service, pizzeria etc ..., it is understood that everything comes together for an enjoyable stay in this beautiful area! - Rental from Saturday to Saturday. Arrival time after 4 pm and imperative departure at 10 am at the latest. - No problem for a delayed arrival or early departure but any week started is due. - A deposit of 30% is required upon booking, the balance 30 days before arrival. - A deposit by check not cashed or in cash will be left at the entrance to the premises and returned on departure, less any damage and missing. The mandatory setup fee is 70 € for T2 and 90 € for duplex. - You will also be asked 150 € / week for any additional person, 50 € for a baby under 3 years (bed-umbrella and high chair included) and 30 € for a small animal. Pool of 11 m by 4 m in free form, with a small children's pool and waterfall. Heated swimming pool with a perimeter alarm. Kitchen with hob, oven and microwave. Fridge-freezer, dishwasher, Nespresso coffee machine and Weber electric grill. Broadband WiFi free access. Flat screen TV and DVD player provided. Vacuum cleaner. A reserved parking. Excellent location, very clean and well equipped. Very attentive host. We thoroughly enjoyed our stay at this property and appreciated the daily texts letting us know what was going on. Bread and croissants on the first morning was much appreciated as was the bottle of wine. Toiletries in the bathroom was a nice touch too. Lovely swimming pool with a great view down to the coast. Very quiet location. Un hôte très accueillant ! Nous avons séjourné une semaine le cadre est magnifique avec une superbe vue sur la mer et la vieille ville de Porto Vecchio. Endroit magnifique!! La vue est superbe. L'appartement est spacieux. L'accueil est parfait. Vous pouvez y aller les yeux fermés !!! A equidistant from the most beautiful beaches in the Far South of Corsica, 15 kms from the Ospedale forest, do not miss the visit of the Bavella needles and a hot river ... Plan a trip to Bonifacio and a cruise to the Lavezzi Islands. - Location du samedi au samedi. Heure d’arrivée après 16 heures et départ impératif à 10 heures au plus tard. - Pas de problème pour une arrivée décalée ou un départ anticipé mais toute semaine entamée est due. - En haute saison, les locations se font au minimum pour 14 nuitées - Nous demandons une participation obligatoire de 90 € pour la mise en place et le ménage. - Rental from Saturday to Saturday. Arrival time and check-in at 4.00 pm and imperative check-out at 10 am - No problem for a staggered arrival or early departure but any week started is due. - Payment accepted: bank transfer, money order or cash - In high season, rentals are for a minimum of 14 nights - We ask a participation of 90 € for installation and cleaning.